These beaded gloves meet or exceed all international glove standards. Consistent comfort and fit make these LATEX Exam Gloves an ideal choice for every staff member. You can have confidence in their ISO 9002 certified manufacturing practices and compliance with US 1000ml water leak testing standards. The gloves are regulated by the FDA to be Examination Grade gloves. Smooth polymer interior coating. Micro-textured surface &#8804; 200 micrograms/g water extractable protein. This makes them ideal for physicians, medical professionals, veterinarians and other specialized health care professionals who use gloves in large volumes. 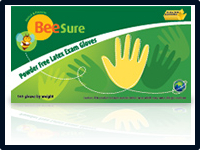 Features: BeeSure Powder Free Latex Exam Gloves has a smooth polymer interior coating which facilitates moist or dry donning efficiency. The micro-textured surface and controlled production process ensure these gloves deliver consistent grip under all operating conditions. These gloves contain 200 micrograms or less of total water extractable protein per gram and are powder-free to minimize your exposure to allergens and irritants. FIRST TOUCH� enhanced. Zero skin contact manufacturing process. You can be sure that you are the first to the touch. Low protein-rated to minimize your exposure to allergen and irritants. Polymer coated for easy donning.